Sad news: the Marines' attempt to integrate women into their Infantry Officer Training Program has officially failed, at least for the time being — the second of two female Marines that tried to make it through the course quit due to medical reasons late last week. The female volunteers were part of an experiment by the Marines to see if women could hack on-the-ground combat, and they must have felt an immense amount of pressure, since tons of skeptical military folks had expressed concerns about whether women would make male marines worse at killing. With that in mind, the way their "defeat" is being reported is more disheartening than what actually happened. 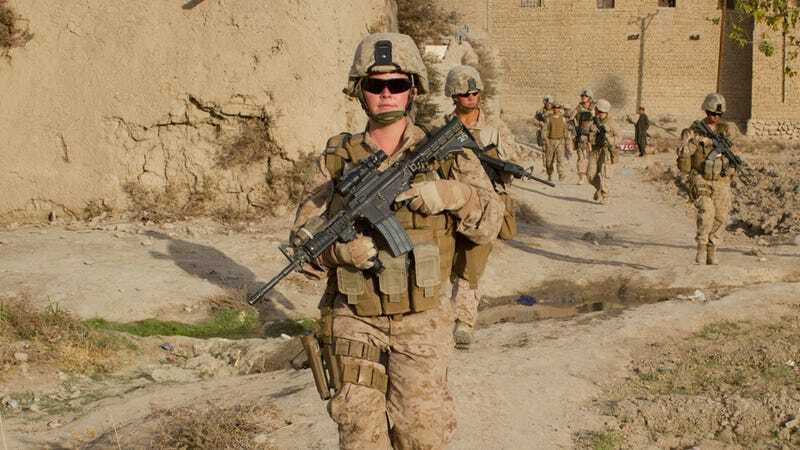 Consider this NPR headline: "Second Female Marine Fails Grueling Infantry Officer Course." According to the article, the first woman "washed out" during the first day of training, but "about 25 percent of the men failed on that first day as well." Wow, that makes it seem like the woman's gender might not have been the sole reason she couldn't complete the program! The two women had statistics against them: the course is so tough that 1 in 5 Marines fail, regardless of whether they are male or female. So it's frustrating for outlets to focus on women "washing out" of the intense obstacle courses and other grueling tasks when many men — more, even — had a hard time, too. The second woman told the Marine Corps leadership that she hoped she would open up doors for women after her. "I don't know how far it will open, but I'm hoping to make a difference for women down the road," she said. So far, no other female Marines have signed up for the next course, but hopefully that will change soon.